Some Grandview residents have interactions with local public officials, and wonder just how a person ends up an elected council member or board seat holder. A much smaller number actively try to run for office. How does that work in Grandview Heights? Brandon Lynaugh decided he needed to try for the city council during the fall 2015 election. He didn’t win, but got a valuable lesson is what is needed to run for a public office. I asked him questions about that run. J.W. : How did you come up with the idea of running? Brandon Lynaugh : There were a lot of factors that led me to run for GH city council. First and foremost it was a desire to serve a community that my family and I have a deep appreciation for. Like a lot of folks in Grandview, we originally came because of the school system. Over the last decade we’ve come to appreciate the community even more and I wanted to do my part to give back to it. While the desire to serve should be at the core of anyone’s decision to run for local office, I was also driven by an interest to give the community a choice in who represents them. I’ve lived here a decade and never once had a candidate for local office knocked on my door. It’s no real surprise as the previous two elections for council were entirely uncontested. No need to campaign when you don’t have any competition I guess? That bothered me. And finally, I thought I had a background and approach that would be an asset to council. It wasn’t to stroke an ego or to set up some future race for higher office as sometimes is the case with local campaigns. I recognized that if elected, I was there to represent the interests of the entire community as best I could and I was excited by that challenge. J.W. Did people contact you to encourage you to run? B.L. : I probably have talked about it with friends and neighbors for a couple years, but nothing too serious. It wasn’t until I worked on the last school levy campaign did I start to think I might make a go of it. But the final decision came after a porch visit by a longtime friend/neighbor. I’ve told a lot of people that it was a combination of civic pride and a little red wine. J.W. : Was the paperwork easy? How did the petition to be placed on the ballot go? B.L. : The process can be a bit tedious. Depending on whether you intend to raise/spend campaign funds the first thing you need to do is file a designation of treasurer with the Franklin County Board of Elections. You’ll then need to collect fifty valid signatures from registered voters in Grandview Heights. I think I collected about one hundred to be safe. Every year there are stories of candidates that fail to make the ballot because of errors with their petitions. The Board of Elections does a good job of instructing candidates on the do’s and don’ts, but it was still nerve-racking to turn them in. Other than getting certified for the ballot, the big paperwork requirements are campaign finance reports and an ethics/financial disclosure form that all candidates and elected officials have to fill out. The disclosure form is designed to prevent conflicts of interest. The campaign finance requirements include pre-election and post-election filings of every dollar raised and spent. Sounds like a hassle, but once you get the hang of it it is fine. This “No Sled Riding” sign in front of the Summit Chase condos has been successful in keeping the snow away from the hill this winter. Seems to have worked too well, it kept all the snow away from the city all winter. I can’t recall another when it was not possible to sled. A work from home scam sign on Goodale Ave. near Urlin. I can’t believe there are people who still fall for this. Also can’t believe that this location is where people who want a work at home job are living, if you can afford to live in this neighborhood, you will not be getting a job from signs on the side of the road. Orange barrels have turned the section of NW Boulevard from First to Goodale into a eye-blasting orange overdose. Sorry about loosing all those parking spots, and the trees that need to be removed for the street construction are on the way to the toothpick factory. Progress! Get out of the way, or you will find an orange barrel placed over your head. I noted in a previous story that there were no yard signs for the Issue 3 renewal on Grandview Ave. near the city hall. I found one, and (record needle scratch) what the heck is that behind it? Grandview has been infected by a case of gigantic sign syndrome! Symptoms are an inflated sense of self importance, and signs in your front lawn that exceed the rules for size set by city ordinance. Expect a 15 foot tall police officer to be arriving soon with a door sized ticket to present to this Gulliver. (Later) Ms. Duvghjvd did not get elected, maybe she should have used a 100 foot tall sign? 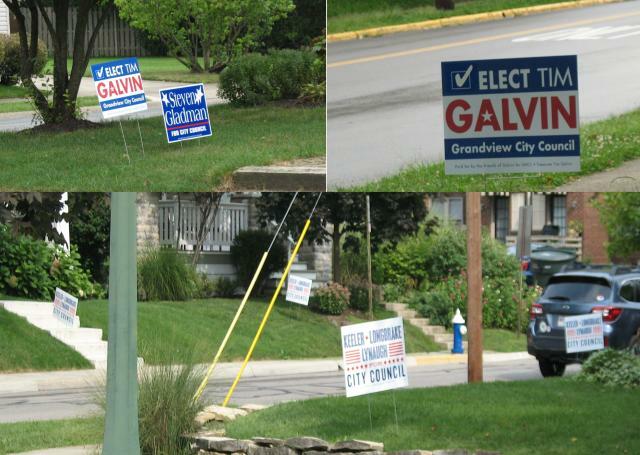 Photo fun, count the number of levy support yard signs on this strip of Grandview Ave. right across from the city hall*. You would not be alone in being surprised by the city tax issue on the March 15th ballot. The city has gone low key, almost stealth, in the hopes of another easy passage of property-tax. Issue 3 is a renewal of the city’s four-year, 7.5-mill property-tax levy. The city says it is needed for general funds, as well as for some street improvements. I don’t think this tax money has anything to do with the city streets and utilities going into the Grandview Yard development, those were supposed to be paid with the TIF money that targets taxes from that development directly into the project’s public costs. There may be some additional costs coming out of the Yard that needs regular city funds – additional police and firemen who will now be in charge of serving this part of the city. I have not heard any numbers from the city on how the development has increased personnel, but it is a sure thing. There are a few yard signs posted around the city to promote the levy. I think you can spot the city council members homes by the occurrence of a sign on a front yard. Will the Gladman income tax relief cause problems with this levy? One of the issues that caused conflict on the council last year was the attempt by Mr Gladman to give 100% tax relief to all residents who work outside the city. While the income tax paid by Columbus workers is similar to Grandview’s, it leaves most workers with an additional tax payment to RITA, his plan cut this tax, while taking $250K away from the city. Some council members thought it was a poorly timed issue, this levy renewal was in the planning stage and it didn’t make the city look consistent by asking for a renewal at the same time it was looking to cut taxes. If you are thinking about voting against this levy, you have a good reason to hit the no button, provided by a council member. Does the school board support the city? The standard way the school board and the city council work is to support each other when they ask for a levy. Apparently the board is asleep – or doesn’t care – about the city levy this time. There is nothing in the school website about the levy, not a word in support of the city in the “Superintendent Speaks” published Feb 24th. Nothing was emailed home with the parents. Unless “Meet Me in St. Louis” is a secret code for “vote for the levy”, the school cares more about the spring play. If you go by the absence of yard signs in front of the board members homes that I pass on the way around town, you would have to guess they don’t support the city. I hope the council members remember this the next time the school board is asking for more money. There was another Issue 3 on the ballot back in the spring of 2009, it was also a renewal that had a low key campaign, and passed by 773 yes, 125 no. Given that the economy was in the crapper that year with no improvement in sight, I was surprised by the numbers. I guess Grandview residents are happy to vote for something that is not an increase (and almost always vote for big increases too). It’s like I’m shouting at clouds when I say this, but the way to keep taxes low and the city representatives on their toes is to say NO every once in a while. Negotiation 101 – suckers take the first offer. A story in the D says that councilman Reynolds has changed his mind and is now against the renewal issue 3. The city has an $8.4 million carryover in its budget from last year, and Reynolds thinks the tax is not needed. Mayor Ray DeGraw is quoted saying “We don’t have surplus money,” and that every dollar in the issue three is needed for long delayed maintenance and buildings. There is almost no chance that issue three will fail, so it is an odd position for Reynolds to take. Anti-tax is a popular position though. Reynolds said in the article that he will not be campaigning to vote no, but he apparently thought it was a good thing to send an email to the news media announcing his flip during the week before the voting. 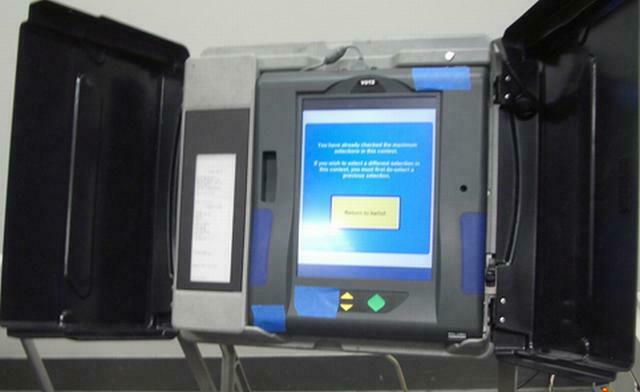 Preliminary vote – 2087 for the Issue 3, and 741 no. This wasn’t the quite the 80% yes vote of 2009, but 73% is close enough to think that any opposition expressed by a council member had little effect. *Trick question! There are no signs. Council member Greta Kearns has moved up to the presidency position at the first 2016 meeting. Chris Smith, who was also elected on an uncontested ballot in 2013, will be the new council vice-president. Kearns is a local attorney in private practice. A quick search of the local news reporting of the council shows that she was not associated with any newsworthy policy changes at the council . She was quoted in one Dispatch story about the possible cancellation of the COTA #19 bus, she expressed opposition to the ending of the route. She served as the Planning and administration chair on the council committee assignment. Sometimes council members with more neutral positions are the ones who can earn the most votes from their fellow council members. Anthony Panzera was first elected to serve as council vice president during a mid-2000’s term on the council. He was elected to the top spot in 2013, and will continue as a regular council member.